Summer is here and everybody's busy looking for a perfect destination. Truly, there are lots of choices here in the Philippines because our country is blessed with natural resources and breath-taking views! However, most of them will require a lot of budget specifically for travel expenses. Money's a big deal especially for those who weren't able to save some for a vacation. That's sad, ey? Well, think over again. There is actually a great place to spend your summer vacation without worrying about costs of plane/ferry tickets. 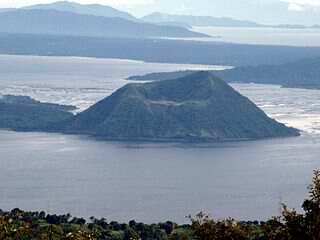 It is just a short drive from Metro Manila, can you believe that? Yes! I am talking about the summer capital of the Philippines in the south; none other than the City of Tagaytay! This is my place of choice that should be included in the 7 Summer Wonders of the Philippines! Why? Though the destination is quite a familiar place for most Filipinos due to relative ease in getting there, it still deserves a spot in the 7 Summer Wonders because everybody can enjoy its scenic views without spending much. The city is blessed with a lake that is popular for its oddity --- a lake with a volcano with a lake within, and an island in the middle of that small lake. Aside from this famous view, the cool climate and clean air of this city makes it a perfect place for outdoor activities like picnic, horseback riding, camping, swimming, sightseeing and much more! Ooops. Though the city is a safe haven where you can unwind, don't forget to bring your skin's bestfriend to protect it against the harmful sun rays. I would personally recommend Nivea Sun because it gives superior protection and makes you fear the sun no more! There are other products that offer skin protection but Nivea Sun's innovative spray formula has a non-greasy and transparent texture which offers immediate and effective protection. It is quickly absorbed and contains a highly effective UVA/UVB filter system. Sounds cool, right? Screenshot of Nivea Philippines Facebook page! Going back to the topic, Tagaytay City really offers a lot more than it's famous lake. It is a perfect getaway destination for families because the city caters activities for all ages! Either outdoor or indoor, you can do anything in this fabulous place! Last year, my friends and I went there to somehow escape our busy lives and to spend quality time with each other too. Our trip there was really a worth remembering one because we were able to enjoy each other's company without worrying about our budget. It's definitely not as costly as any other summer destinations but you may enjoy summer all the same! Glad to hear that going there isn't costly!